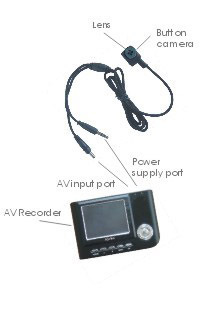 The World's Smallest audio Video recorder with Button shape camera for hidden AV recording. Connect the button camera directly with our AV recorder, no external power needed for the camera. super crisp real time audio video recording with date and time stamping. 1. Special design for evidence collection. 2. Real time recording with date and time stamping. 3. Smallest Button shape camera with hidden AV recording. 4. No moving parts, inside SD / MMC card slot. 5. Great for investigation or surveillance. 6. No extra power needed for camera. 7. Play and record all kind of MP4 movies. 8. Play and record Mp3 songs. 9. Built in 128MB memory. (1 GB optional SD longer recording). 10. 1GB SD card (not included) can record 4 hours of audio video. 11. No installation just plug and play. 12. 10 Pcs. extra matching Buttons are included for the whole shirt. 13. 2 pcs. Changeable Rechargeable battery included. 14. Built in speaker + fashionable Earphone. 15. Built In microphone in camera for audio recording. 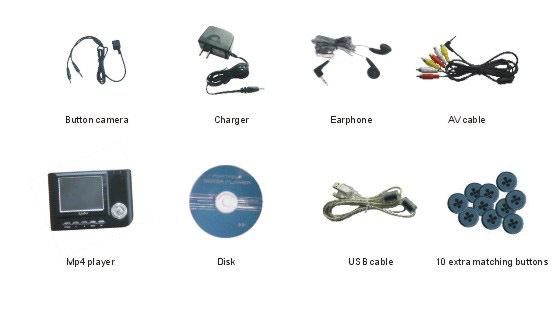 1- Button Shape Camera with audio recording. 2- 10 extra matching buttons. 3- 2 pcs. Lithium rechargeable battery. 4- Super Mini pocket Audio Video Recorder. 11- One year limited guarantee.